ABB’s factory of the future delivers a custom-made wristwatch within three minutes. It is on display at this year’s edition of the Hanover Messe, the world’s largest industrial trade show (Hall 11, A35), and demonstrates the vast possibilities of modern production. Federal Chancellor Angela Merkel and the Swedish Prime Minister Stefan Löfven toured the booth with ABB CEO Ulrich Spiesshofer, for a glimpse of the digital technologies provided by ABB. The factory of the future enables companies and enterprises of any size to be as flexible as possible, while increasing productivity, enhance operational efficiency and improve safety and security. In Hanover ABB, a technology leader focused in digital industries, is showcasing solutions to some of the world’s biggest challenges, which are addressed by the Energy and Fourth Industrial Revolutions and are changing the way we power our societies, produce our goods and services, and work, live and move. The Fourth Industrial Revolution is shaping the factory of the future by processing ever-growing volumes of data generated from smart automation and producing analytics that drive performance. Smart, connected factories are the future of manufacturing. And just as over a century ago when it was at the forefront of electrifying cities and railways, ABB leads the way with its suite of ABB Ability™ digital solutions. ABB’s factory of the future at the Hanover Messe features industry-leading digital twin technology, which makes it possible to amend and optimize manufacturing without interrupting the production process. The solution is the first result of a strategic partnership between ABB and Dassault Systèmes, which was announced in February. It also underlines ABB’s partnership strategy to deliver customer value at the cutting edge of industrial digitalization. Separately, at the Dassault Systèmes booth (Hall 6, K30) visitors can watch a complete digital twin of an ABB spot welding application, involving a high-performance ABB IRB 6700 robot armed with a welding gun and other corresponding equipment. As welding automotive parts has become more complex in recent years, designing production around the optimal robotics path is critical to boost weld quality and productivity. The Dassault Systèmes solution will integrate a digital twin that complements ABB’s RobotStudio software to simulate the application and illustrate how it can augment production by outlining the best possible robot path. A key feature of the factory of the future is the sensor, which collects and feeds information about the production process into the industrial internet. ABB has developed a compact ABB Ability™ Smart Sensor that can be easily attached to the frame of a low-voltage induction motor, mounted bearings and pumps to measure key parameters, such as vibration and temperature. Using on-board algorithms, based on ABB’s decades of expertise in electric motors, the ABB Ability™ Smart Sensor gathers information about the equipment’s condition and sends the data via a wireless Bluetooth connection to a secure server, from which it can be accessed through a smartphone or tablet. 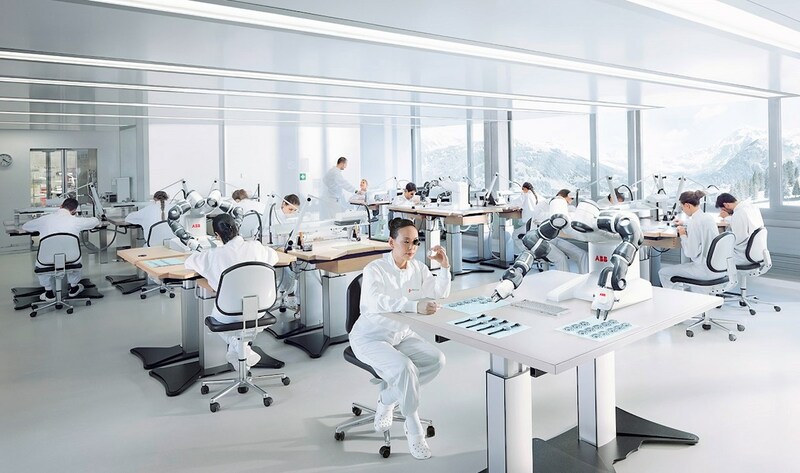 YuMi® collaborative robots perform precision assembly operations; the SuperTrak flexible transport system orchestrates the timely movement of parts from station to station; and ABB Ability™ Connected Services monitor health and performance. As the factory of the future develops, people and collaborative robots like YuMi® will work side by side. Robots will deliver repeatable quality by taking on repetitive tasks – which are often dirty, dangerous and dull – and they'll handle computer-controlled decision-making duties. Increasingly computer-controlled decision-making, based on industrial artificial intelligence, will support man and machine. In 2018, ABB and The Economist published The Automation Readiness Index, which states that the countries with the highest adoption rates of robots and intelligent automation – South Korea, Germany and Singapore – also have among the lowest unemployment rates in the world. Robots, as well as autonomous systems, will be crucial in augmenting the workforce in the very near future. This will, in turn, create opportunities for people to develop new work opportunities that are more inspiring, intuitive and interesting. For example, people can offer process knowledge, as well as the insight and improvisation required to identify new efficiencies and devise production improvements. Augmenting human potential with technology, in a responsible way, while providing ongoing education and training, is an opportunity to drive prosperity and growth. Lifelong educational ecosystems will emerge from efforts like ABB's support for practical vocational training for the jobs of the future.